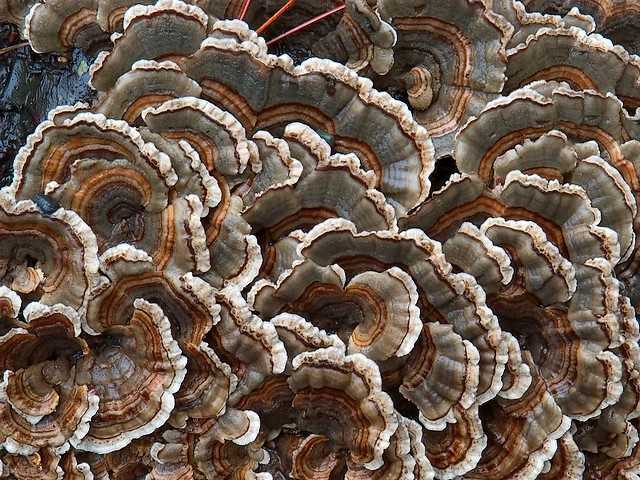 The 'Trametes versicolor' mushrooms, which resemble to the tail of the wild turkey, found among the beautiful landscape of the lake Treman in 'Buttermilk Falls State Park' near Ithaca, New York, USA. They are polypore mushrooms, which are spread in a wide variety of colours throughout the world. In Chinese medicine they are recognized as a medicinal mushroom under the name yun zhi and are used for immuno-adjuvant therapy of cancer.